I simply replaced traditional bleached flour with my favorite Cup4Cup Gluten-free Multipurpose flour. This stuff is so good, I’m thinking about giving away some bags soon with my next giveaway! But more about that later. 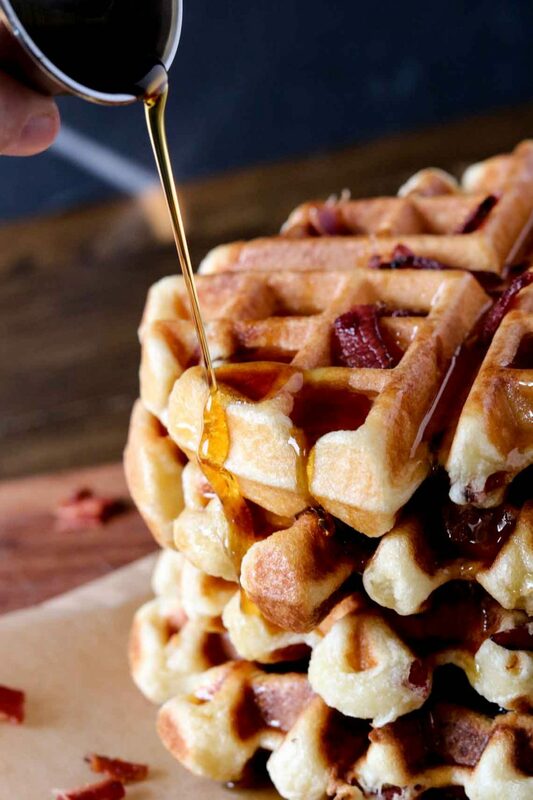 This batter will seem a little more ‘gummy’ than traditional waffle batter, but don’t worry, they’ll still turn out just as fantastic. 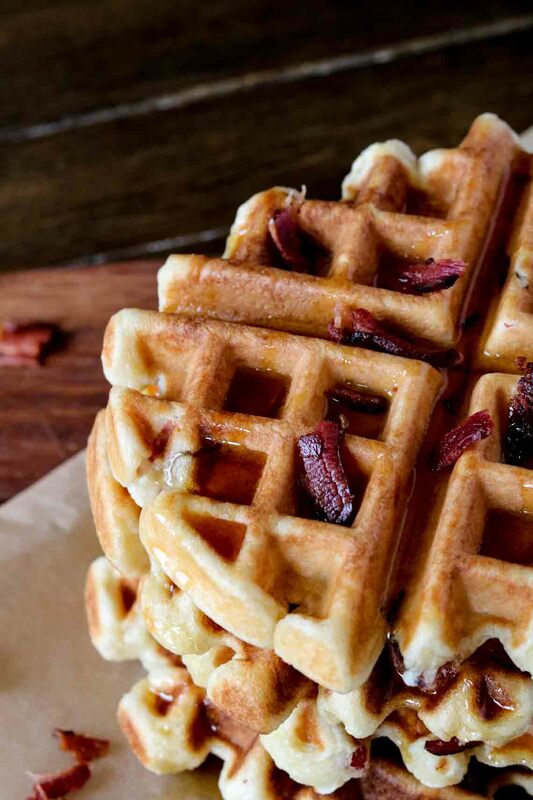 I also swapped out regular dairy milk with canned coconut milk, added in bacon and maple syrup to the batter and BAM, you’ve got Paleo bacon waffles! The key to good waffles is cooking them long enough to brown and crisp the outside while the inside stays soft and fluffy. If you pull them out too early they’ll be rubbery. Some waffle makers will have a timer/light on them that will indicate when they’re done cooking (like in many hotel continental breakfasts) but if not, just keep popping the lid up and checking your waffle. Once the outside is nice and crisp/firm and can easily lift with a fork they’re ready. In a medium sized skillet, cook bacon slices. Once finished, remove from pan and place on paper towel lined plate to cool. Crumble bacon into small pieces. In a large mixing bowl, add eggs and whisk lightly. Add in all remaining ingredients, including bacon crumbs and stir well to combine. 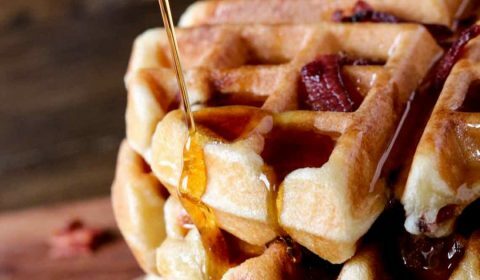 Heat your waffle maker and spray or grease with coconut oil. Close the lid and cook for about 2-3 minutes or until crisp and browned on the outside and lifts easily with a fork. Continue cooking waffles until all battered has been used. 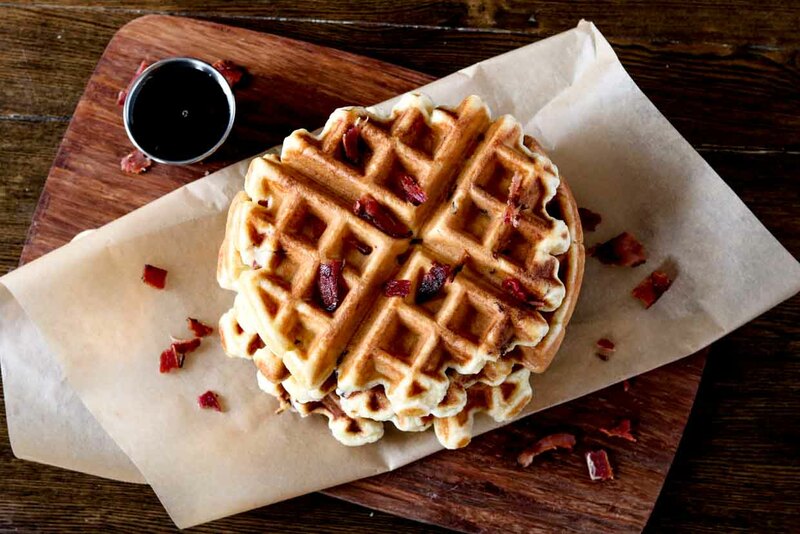 Serve with warm maple syrup and additional slices of bacon, if preferred.